What is the world's most popular meat? I’ll bet a lot of you guessed chicken or pork. Some of you probably thought beef. Surprise! In the United States, we tend to consume chicken as our white meat of choice and beef as our red meat, but 63 percent of the world's population eats goat meat. Interestingly, more and more goat meat is being consumed in the United States and not just as an ethnic dish due to the growing ethnic population. The health-conscious consumer is also looking at the benefits of incorporating either cabrito (a delicacy meat from goats that are harvested between 1 to 3 months of age and weigh less than 50 pounds) or chevon (goats that are harvested between 6 to 9 months of age and weigh between 50 and 75 pounds). Older goat meat is also consumed but usually as sausage or in chili. 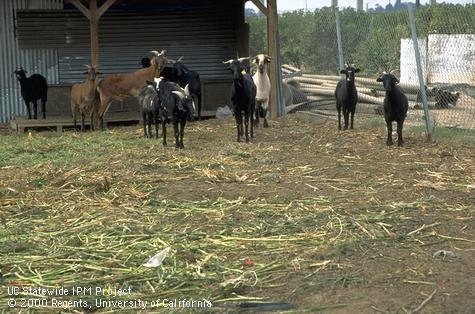 Mendocino and Lake livestock producers, especially those who want to sell local, might want to consider adding goats to their mix of cattle and/or sheep. I know some are already ahead of the curve (see our goat producer directory). Multi-species grazing on our rangelands not only provides economic diversity for the ranch but utilizes our rangeland forages better than single-species grazing. But let’s get back to that health-conscious consumer and why demand for goat meat is growing. The table below shows the nutrient comparison of goat meat to traditionally raised chicken, beef, pork and lamb. You can see that goat meat is lower in calories, total fat, saturated fat, and cholesterol than the other meats. Less saturated fat and less cholesterol mean healthier red meat for the health-conscious consumer. Additionally, goat meat has higher levels of iron (3.2mg) when compared to a similar serving size of beef (2.9 mg), pork (2.7 mg), lamb (1.4 mg), and chicken (1.5 mg). Comparatively, goat meat also contains higher potassium and lower sodium levels. In terms of essential amino acids, goat meat closely resembles beef and lamb. With these benefits, it’s clear why consumers are developing an interest in eating goat meat. bacon is my favorite meat of all the meat there is also ham and pork and that is it. For me pork meat is number 1. Goat meat is 1000times better than any othe red meats. & In all over the world it holds the position of being most famous red meat. Because there are lots & lots of people who don't consume beef or pork in their country as it is against their ethics & religion , whereas goat meat is so popular as red meat that you can see people consuming it in every corner of the world . I was looking for some lamb for Chili at a local mexican meat market and he was out but suggested Goat. Hard to tell in a Chili that has a mixture of beef, pork and goat in equal parts but it tasted good to me and my wife. After seeing the health benefits I might start using it more. have crow meat its way better than the rest n its the best. A very tasty meat, lean and works well in most dishes but in curries it is supreme. I have heard that this animal is the only one that stores vitamin C in it's body. That needs substantiating. Pork is the best meat both in terms of flavourful and taste. i love bacon and ham!! Thanks for the great nutritional information!! Goat is greatest of all time. Chicken is #1. I'm Muslim so I do not eat pork. Chicken bacon and chicken ham are also awesome! Meat is a sad food group especially when a lot of people do not like to eat animals. However the consumption of goat over chicken is an amazingly scientific discover. Insects are the most healthy,nutrient rich and tastiest food sources on the planet. Goat meat is healthier than most other meats. It's a remedy for weakness of the body. And people associated with sports should have it once in a week or two. It's good for keeping them and their bones healthy and strong. How about fish, or is it just a lot less popular than these other meats? I believe it's very nutritious with a lot less of the bad things than these other meats.